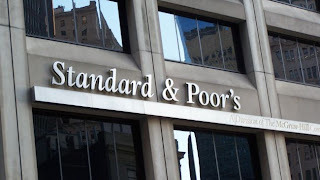 KIEV, Ukraine -- Ukraine’s junk credit rating was affirmed by Standard & Poor’s, which trimmed its medium-term economic-growth forecasts and warned it may downgrade the former Soviet republic in the next year. S&P maintained the rating at B, five steps below investment grade and on par with Bosnia & Herzegovina. It kept its outlook at negative, saying there’s “at least a one-in-three chance” of the rating being cut in the next 12 months without government action to secure foreign-currency funding for debt servicing. “Ukraine’s economic performance has weakened since we last lowered out ratings,” S&P said today in an e-mailed statement from Dubai. Ukraine exited a six-month recession in the first quarter as gross domestic product rose 0.5 percent from the previous three months. Still, the economy shrank 1.3 percent from a year earlier as industrial production plunged 5 percent and government efforts to agree on a $15 billion bailout from the International Monetary Fund have so far failed. The yield on the government’s dollar bonds due 2023 fell one basis points from yesterday to 7.74 percent as of 12:50 p.m. in Kiev, data compiled by Bloomberg show. The hryvnia slid to 8.1375 per dollar from 8.1450. Bond-market history indicates that the utility of sovereign ratings may be limited. Almost half the time, yields on government bonds fall when a rating action by S&P and Moody’s suggests they should climb, according to data compiled by Bloomberg on 314 upgrades, downgrades and outlook changes going back as far as the 1970s. Ukraine’s economy is suffering from weak foreign demand for metals and machinery and further declines in industrial production, according to S&P, which trimmed its forecast for average 2013-2015 GDP growth to 2.5 percent from 4.1 percent. While Ukraine has sold debt to international investors, “these favorable conditions could prove fleeting,” it said. A sale of state-owned energy company NAK Naftogaz Ukrainy would help ease financing pressures, S&P said.